It wasn't until February 1 1972, that Hewlett-Packard introduced the HP-35 electronic calculator. 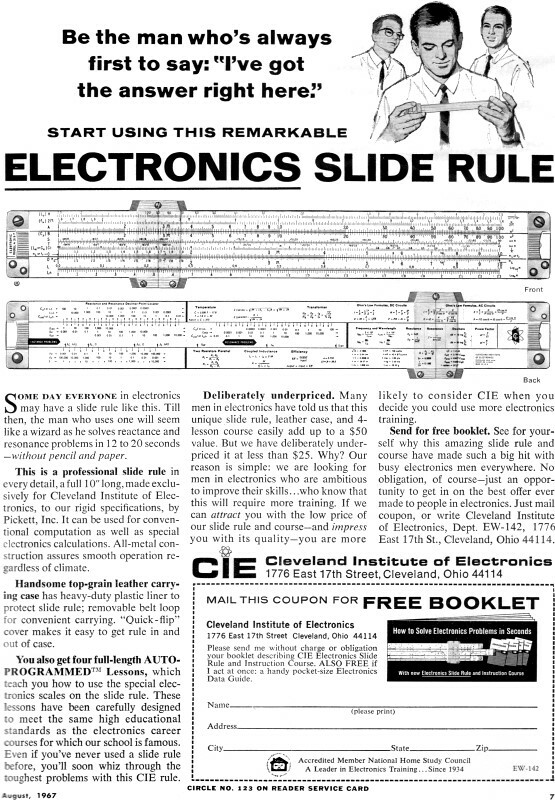 Before that, when you spoke of an electronics calculator it referred to a computer (likely a vacuum tube type), a human who specialized in electronics calculations, or this special slide rule sold by Cleveland Electronics Institute - the 515-T. It had special scales for calculating reactance, and resonance, and had common circuit analysis formulas printed on the back side. 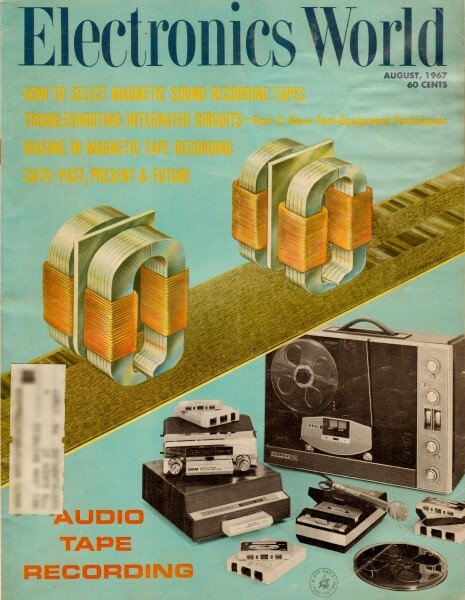 Here is an RF Cafe web page dedicated to engineering slide rules and my small collection that includes a 515T. I will gladly accept a donation and credit you accordingly. Be the man who's always first to say: "I've got the answer right here!" Some day everyone in electronics may have a slide rule like this. Till then, the man who uses one will seem like a wizard as he solves reactance and resonance problems in 12 to 20 seconds - without pencil and paper. Send me an e-mail if you want a PDF file of a partial (10 pages) copy of the instruction manual. This is a professional slide rule in every detail, a full 10" long, made exclusively for Cleveland Institute of Electronics, to our rigid specifications, by Pickett, Inc. It can be used for conventional computation as well as special electronics calculations. All-metal construction assures smooth operation regardless of climate. Handsome top-grain leather carrying case has heavy-duty plastic liner to protect slide rule; removable belt loop for convenient carrying. "Quick-flip" cover makes it easy to get rule in and out of case. You also get four full-length AUTO-PROGRAMMED™ Lessons, which teach you how to use the special electronics scales on the slide rule. These lessons have been carefully designed to meet the same high educational standards as the electronics career courses for which our school is famous. Even if you've never used a slide rule before, you'll soon whiz through the toughest problems with this CIE rule. Deliberately underpriced. Many men in electronics have told us that this unique slide rule, leather case, and 4-lesson course easily add up to a $50 value. But we have deliberately underpriced it at less than $25. Why? Our reason is simple: we are looking for men in electronics who are ambitious to improve their skills ... who know that this will require more training. If we can attract you with the low price of our slide rule and course-and impress you with its quality - you are more likely to consider CIE when you decide you could use more electronics training. Send for free booklet. 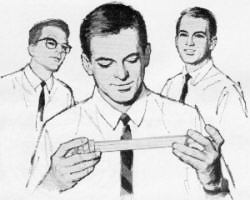 See for yourself why this amazing slide rule and course have made such a big hit with busy electronics men everywhere. No obligation, of course - just an opportunity to get in on the best offer ever made to people in electronics. 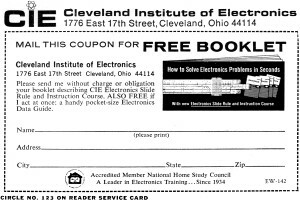 Just mail coupon, or write Cleveland Institute of Electronics, Dept. EW-142, 1776 East 17th St., Cleveland, Ohio 44114. 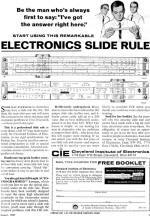 Cleveland Electronics Institute's "Electronics Slide Rule"
Here is the original scan.